Keeping accurate employee files isn’t just good business; it is also a legal requirement. Most processing problems are due to human error. If you can minimise the number of times information is handled or data needs to be keyed into a system, you’ll have fewer mistakes. Automation reduces the labour costs of sending, collecting, storing and updating employee information. These savings go straight to the bottom line. Want to make sure your onboarding system has full automation capabilities? 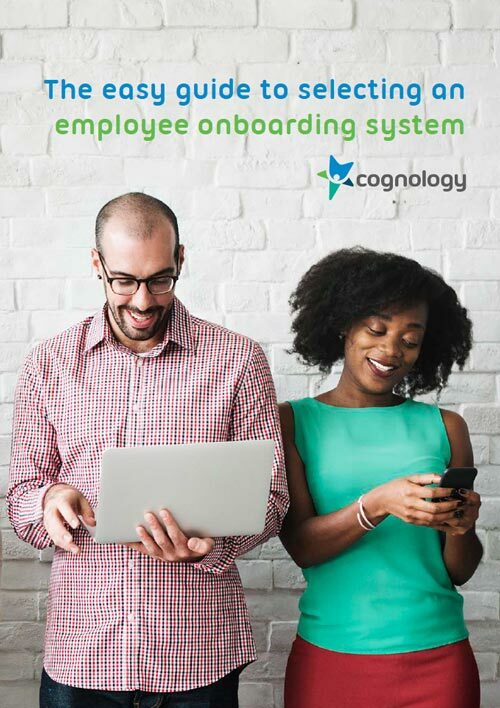 Download the Easy Guide to Selecting an Onboarding System for a comprehensive overview of the ‘non-negotiables’ your organisation needs. Automated workflows improve the overall employee experience and increase confidence and trust. By creating great impressions right from the start, not only is your new hire more likely to show up on their first day, but they may also stay longer. Preboarding paperwork includes all documentation required to formalise the employment relationship. With an integrated onboarding automation tool, you can use information collected during the recruitment process to personalise and tailor documents and send them directly to your new hire online. With an automated tracking process, you’ll also be notified when your new hire receives and completes their paperwork. Even government forms like Australian Tax Declarations and Fair Work Information Statements can be accessed and completed online. With automated workflows, requests for software access and equipment can be submitted and approved swiftly, so your new hire can be provisioned with necessary resources without delay. Under Australian workplace law, an employer must make their staff aware of workplace policies, procedures and rules that govern their employment. Onboarding software lets you create, distribute and store acknowledgements that your staff have received, read, and understood workplace policies. While technology can never replace the human touch, it does allow you to deliver key messages at the exact moment you want to communicate them. For example, a timely welcome message from the CEO can reinforce your new hire’s decision to accept your offer of employment over the competitor who is snapping at your heels. Automated reminders such as prompting a buddy to arrange a coffee with their new charge can also be useful to ensure social and cultural onboarding tasks are not forgotten. Yes, you can even automate relationships! Peer to peer social enterprise tools help introduce your new hire to the broader team. And the faster your new hire builds networks and knows who they can call upon to get something done, the sooner they will be effective in their role. With automated workflows, probationary reviews will always be completed on time. An effective automation tool will seamlessly transition your new hire to your company’s ongoing performance management processes. Self-serve access to a variety of eLearning activities will give your people the ultimate flexibility to tailor their onboarding programme. Implementing automated onboarding surveys will increase response rates and ensure you get timely feedback and insights into the onboarding process at key milestones. When internal employees shift roles, they may be joining a new team, working for a new manager and perhaps even experiencing new aspects of the culture. Like onboarding new hires, intraboarding often includes new paperwork, training, new system access and equipment, and new performance milestones. Automating the intraboarding steps will almost certainly guarantee a smooth transition for internal staff.